An amber collector in Germany has spotted the ancient remains of a beetle never before seen in the fossil record. TINY FLIER Feathery wings extending from the posterior of this tiny ancient beetle (in amber), the first of its kind to be discovered, may have helped it drift on the wind millions of years ago. 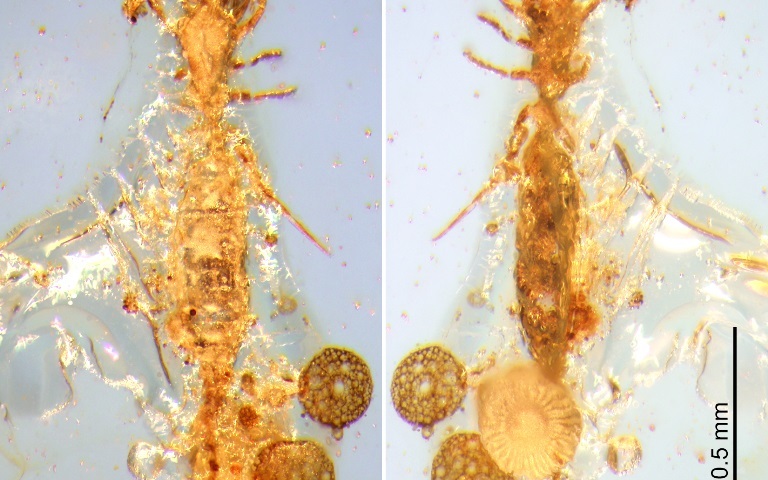 Two itty-bitty specimens, entombed in amber since the middle Eocene epoch some 54.5 million to 37 million years ago, represent a new species of Jacobson’s beetle, researchers report online March 28 in the Journal of Paleontology. The beetles, Derolathrus groehni, are, like their modern relatives, about as long as the width of a grain of rice. MicroCT scans and other images revealed narrow bodies, a shiny brown exterior and two wispy featherlike wings protruding from the hindquarters, angled like the blades of a helicopter. The fossils look just like today’s Jacobson’s beetles, says study coauthor Chenyang Cai of the Chinese Academy of Sciences. 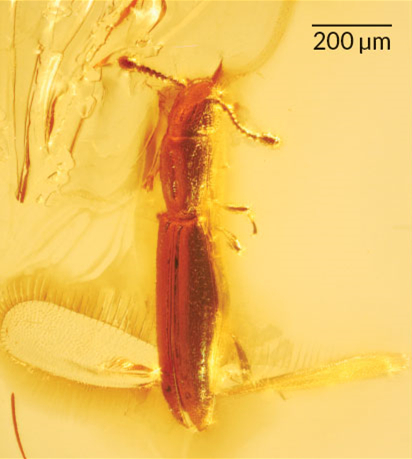 Chinese scientists have found ant-like stone beetles inside a piece of Burmese amber from the mid-Cretaceous period, about 100 million years ago. The beetles are the world's earliest known insects to eat springtails, an insect-like food resource for litter-dwelling beetles. 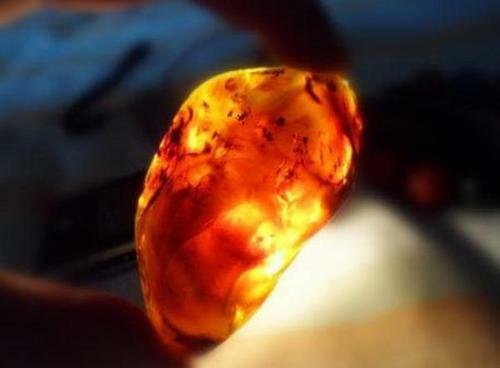 Scientists announced Friday in Beijing that a fossilized-feathered dinosaur tail has been discovered in a piece of amber, complete with bones and feathers.